In addition to having a robust, secure IT infrastructure for your business, finding effective strategies to market your products and services is probably high on your list of priorities. 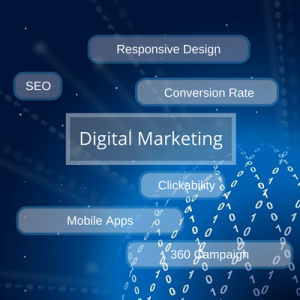 Employing cutting edge marketing technologies, Digital West can help you drive more leads, build brand exposure and consumer confidence, and make your business stand out from your competitors. We offer a selection of website design and hosting services, as well as digital advertising resources. Digital marketing is generally more cost efficient than offline marketing channels, generates higher engagement rates, and provides the ability to track conversions. And, with mobile usage at record high levels, your digital marketing efforts can now be targeted with pinpoint precision – right where your customers are! You can register your domain, host your website, manage multiple email accounts and get SSL certificates for your website all through Digital West. We’ve got you covered with our industry-leading cPanel hosting platform and 24/7 live and local tech support. When you don’t have the resources in-house to design your website, contact us. We can provide you with recommendations or you can go all-in and have us develop custom web applications, intranet solutions, unique database implementations or front ends for almost any modern CMS platform. Get your message out with extraordinary precision, directly into households or businesses, with our IP-based advertising. This revolutionary service is like having your own digital postman who delivers your ad to specific physical locations for pennies on the dollar.